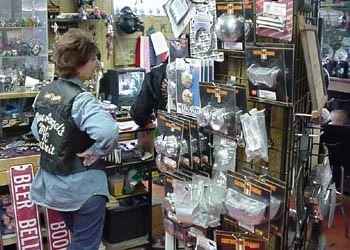 On premises we carry a wide selection of parts, chrome, shirts and accessories. 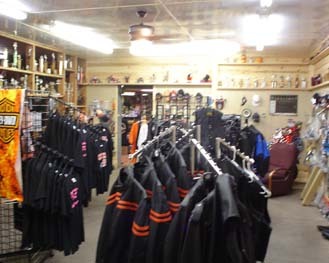 We are dedicated to filling your every motorcycle need. If you discover we do not have what you need in stock, we can easily order your part or parts and have them here for you in a very short time. Our knowledgeable and courteous staff is ready to help you any way we can. Our goal is to get you back on the road quickly and SAFELY! We stock a wide selection of parts and accessories from great suppliers such as Custom Chrome, WPS, Drag Specialties, Parts Unlimited, V-Twin Manufacturing, and more. What we may not have in stock we can order, often having them on hand the very next day! So whatever you need for that quick repair, tuning, major overhaul, tricked out custom, or to restore you r vintage .... we can help you get it done in a very short time. ADDING NEW KINDS OF THINGS THIS YEAR .... ONE OR TWO THINGS AT A TIME !!!!!! CHECK IT OUT ! What we carry changes from time to time. Who knows, we might just have that rare item you're looking for on hand!!!! Not looking to buy anything? Well, come on in and just say HI! We're just like you, we understand. Make Cycle-Moore your ride destination, or just a stop along the way. A CHANCE TO CHECK OUT OUR WORKING MUSEUM !!!!!!!!!!!! We look forward to seeing you!!!!!!!!!!! !